ISTANBUL, TURKEY – September 26, 2017 – GE (NYSE: GE) will manufacture Turkey's largest generator transformer for TERNA SA (member of GEK TERNA Group) at its Power Transformers factory in Gebze. Approximately 85% of products manufactured in this factory is for the export market. This 820 MVA Generator Step-Up Transformer to be manufactured at this factory will be the largest generator step-up transformer to be used in Greece. Scheduled for completion in 2018, the transformer will be installed at Ptolemais Power Plant located at the Komanos mine in Western Macedonia Prefecture - Greece. The transformer will be designed and manufactured as part of a new 1 x 660 MW, pulverized Lignite Fired Thermal Power Plant (Ptolemais Unit V). TERNA S.A. (TE) has been awarded the EPC Contract by PPC to build the aforesaid Project – “Ptolemais SES Unit V – Engineering, Procurement, Transportation, Installation and putting in operation a steam unit of Gross Power 660 MW firing pulverized lignite and capable to supply 140 MWth thermal power capacity for district heating. This project by TERNA will allow significant improvement in its ecological footprint for the Ptolemais Power Plants. It is also expected to reduce the cost of power generation and contribute to Greece's energy infrastructure, power grid reliability and supply security. The transformer offers the highest possible yield in technical terms in relation to its minimal size and cost. It will enable lower fuel consumption for power generation through low losses and higher productivity, resulting in a reduction of power costs. This increased efficiency decreases emission levels produced by the power plant to the standards established by Greece and the EU. GE's factory in Gebze is a competence center in manufacturing of special transformers and reactors used in heavy industry with around 70 people R&D team. "We are expecting to complete the transformer within a year and export it to Greece for installation at Ptolemais Power Plant. This engagement proves that Gebze factory with its high-quality standards, modern manufacturing techniques and advanced test laboratories is chosen in not only Turkey but also around the world,” said Hakan Karadogan, Power Transformers Product Line General Manager at GE Power's Grid Solutions business. 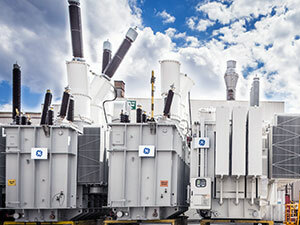 Operating in Gebze since 1966, GE's Power Transformers factory is one of the most leading-edge high voltage transformers factories in the world with a production capacity of 40,000 MVA. Built on an area of 90,000 square meters, the factory has around 1,000 employee. Exporting 85% of its output, GE's Power Transformers Factory in Gebze has been awarded with the first prize in the category of "Electricity Transmission and Distribution Equipment" in “2016 Export Achievement Awards” organized by the Electrical Electronics and Services Exporters' Association (TET), and maintained its title of export champion. Last year, the factory initiated the brilliant factory transformation process as one of the best practices in the world. Design, production, supply and service networks will be connected for optimum production in the brilliant factory.